Welcome fellow drone enthusiasts! 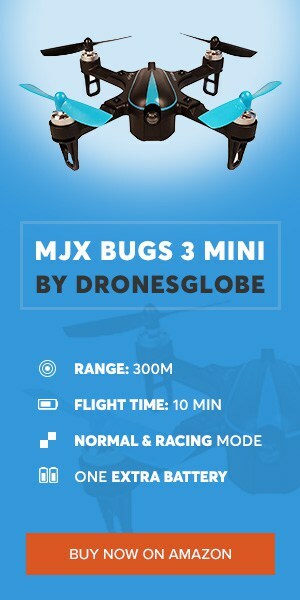 Once more we have the opportunity to present to our readers a review of one of the best drones under 200$on the market. Today we will analyze a relatively new product from the Holy Stone, one of the leading manufacturers of beginner and intermediate drones. This US company is renowned for its quality, uniqueness and competitive prices whose projects are constantly improving the industries boundaries. The quadcopter HS300 is, definitely, the best choice for drones with the camera under 200$ and is suitable for beginners with some or no experience in drone flying but also for some less demanding advanced pilots. Find out more about the model HS300 in DronesWorld’s new review below. The first thing we can notice when opening the box is the actual size of the HS300 quadcopter and its weight of 1.4 pounds (0.633 kg) which is massive when compared to other under 200$ models. You could question its performance immediately due to this fact but on the contrary, it is a good thing as it allows HS300 to fly much better against the wind compared to the cheaper drones in its group. This quadcopter has a great design of landing gear and propeller guards which enhance its capabilities for maneuvering in the air. The body of the quadcopter is smooth and quality made which feels like ABS plastic and is great on touch which provides an experience like holding a more expensive drone. One of its main characteristics- long propellers this quadcopter enormous flight stability which can be noticed! For amateur drone pilots will take them about 15 minutes to assemble HS300 out of the box and another 15 minutes for reading manual instructions which is, of course, optional rather than mandatory due to the very intuitive nature of this process, and you are ready for going on your first takeoff. Even if you crash few times upon takeoff don’t worry as it will not damage the HS300 due to its solid structure.HS300 quadcopter’s design ensures that it is very safe to control, therefore kids under 14 years old are able to use it, with parent supervision which is advised by the manufacturer. As we mentioned above HS300 quadcopter is probably the best camera drone under 200$ for its camera capabilities and video quality. HS300 comes along with spare parts and HD1080p Camera which is equipped with professional 1080p 120° Wide-angle HD Camera and which allows its users to capture high-quality video and clearer images. It comes on a 2-axis gimbal and it can be detached from the quad. Although you will need some time for mounting it, this 5MP action Camera ensures that your videos are recorded in 1920x1080p with 30 fps (frames per second) and pictures taken in high resolution (2592×1944). These videos and pictures are immediately stored on 4gb SD memory card which comes along in the package from Holy Stone. The HS300 quadcopter’s 1080p 120° Wide-angle camera and flight performances gives its pilot a luxury of capturing good aerial videos and pictures which will, definitely, impress your friends and family. These 120° wide-angle 1080p above average image quality capabilities, which gives HS300 quadcopter a top place on drone market when considering the great price/quality ratio. If a pilot is more demanding regarding the camera performance, there is always an option of buying a GoPro Camera which is fully compatible with HS300 quadcopter and this fact is a big advantage for potential more demanding buyers. There are many additional features from Holy Stone’s quadcopter HS300 which will definitely hook potential buyers. Besides HD camera, more features such as one key landing, headless mode, speed control, 360°stunt, 6 axis gyro, emergency stop and low voltage protection.The most important feature is definitely automatic altitude hold which is a powerful air pressure altitude function and allows HS300’s pilots to release the throttle stick and the quadcopter will keep hovering in the air at the current desired height. This feature is great for taking high-quality steady videos and pictures. One key landing which HS300 quadcopter pilots can use is amazing for safer landings which greatly reduces the amount of crashes at this point of flying this quadcopter. There are also the headless mode for better control in the air, 6-axis gyro for greater flight stabilization, low battery alarm and many of LED lights to make HS300 more visible by its pilot in the air.The controller is nice looking, responsive and easy to handle. All these features are great in helping first-time pilots and they can enjoy smooth design with stable and responsive functions which this quadcopter has and is easy to control and maneuver. HS300 quadcopter drone, unfortunately, does not possess the FPV and GPS technology, but these features are not necessary for beginner pilots and would raise the price of drone above 200$ mark. The HS300 can deliver from 8-12 minutes when properly charged and you have two 7.4Volts, 2000mAh, Li-Po (14.8Wh)batteries in the bundle included which is amazing, when considering the fact that it takes truly some time to fully charge the battery (around 200 minutes) and this battery life is much better than many other quadcopters. HS300 quadcopter has a control distance of 150m and has very powerful engines (2.4GHz). Although the flight time always depends on weather conditions, HS300 has shown remarkable performances, with its 6-axis gyro and 2.4GHz motor, regarding controlling and flight stability even in windy conditions due to its design and construction. Although this quadcopter is big it is very powerful and fast. THE GOOD Stable, responsive, easy to take videos and photos, high video and image quality, battery life, extra battery, spare parts, price, great customer service from manufacturer. BOTTOM LINE The package box from Holy stone HS300 contains: (1x)Drone, (1x)Transmitter, (1x)1080p Camera, (1x)4gb SD memory card, (1x)Camera Shockproof Device, (2x)7.4V 2000mAh/14.8Wh Batteries, (2x)USB Cables, (1x)Screwdriver, (4x)Extra Propeller Blades, (8x)Extra Landing Gear Screws, (8x)Extra Propeller Guard Screws and (1x)Manual. Holy Stone HS300 quadcopter is the best pick if your budget is less than 200 dollars and you want to have fun with your friends and family with high-quality videos and photos. Whether you are a newcomer to drone piloting or slightly experienced user this drone will satisfy your needs and make your every penny invested worth. The manufacturer provides an exceptional customer service and all users are astonished by their quick and quality customer care. Dronesworld community hopes that this review was helpful in choosing the right drone to buy. What would cause the HS300 Quadcopter lose radio connection and fly off on its own?